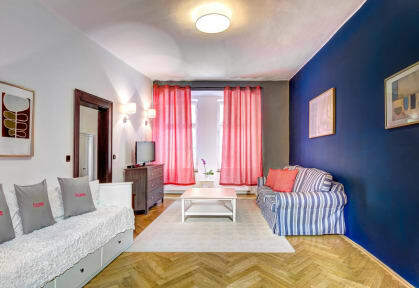 ABC Suites i Prag, Tjekkiet: Reservér nu! Our apartment house is a house from 15th century just in the middle of Old Town - less than 5 min walk to Old Town square or Charles Bridge- all in UNESCO protected area. The apartments are newly reconstructed, fully equipped with free Wi-Fi internet access. As you stay in the very heart of the Prague`s Old Town you can walk to all Prague`s sights, famous restaurant, bars, cafes and nightclubs. 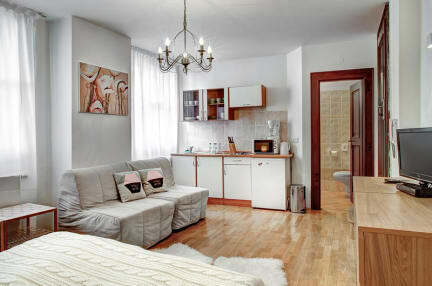 All our apartments are equipped with fully equipped kitchen, Satellite TV, free WI-FI access in all house, fridge. Of course all apartments have own bathroom and restroom. We can pick you up directly at the airport or railway station. Just send us your flight or train schedule so we can wait at the airport. We accept credit cards VISA, EC/MC and of course cash in EUR and CZK. Please be advised that for the property to be able to pre authorise the amount of the first night from a payment card in advance.